Annyarkku Praveshanamilla malayalam movie directed by V S Jayakrishna featuring Suraj Venjaramoodu and Tini Tom in lead roles. Sreejith Ravi, Avantika Mohan, Sree Dhanya, Kochu Preman, Sandeep, Ponnamma Babu and Lakshmi Priya will give life to other prominent characters in the movie. 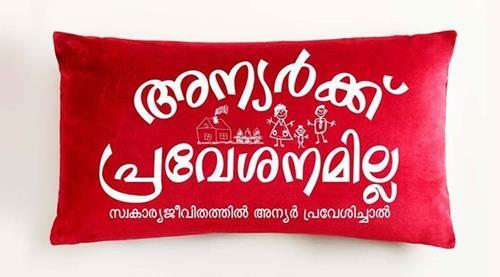 Produced by Sajesh Nair under the banner Gramy Entertainment Company, the movie will be a family entertainer which is being narrated in a humorous way with a suspense element. After creating his own space in the malayalam film industry through typical roles, actor Tini Tom has been roped to play the lead role in V S Jayakrishna's directorial debut. Titled 'Annyarkku Praveshanamilla', the movie scripted by Jayaraj Madambi and Hari Madambi will be an in and out comedy entertainer. Apart from Tini Tom, the movie will have Suraj Venjaramoodu, Sreejith Ravi, Avantika Mohan, Sree Dhanya, Kochu Preman, Sandeep, Ponnamma Babu and Lakshmi Priya in prominent roles. Produced by Sajesh Nair under the banner Gramy Entertainment Company, the movie will be a family entertainer which is being narrated in a humorous way with a suspense element. Tini Tom gives life to a dubbing artiste. Scripted by Jayaraj Madai and Hari Madai, the movie revolves around the common problems that happen when a third person interferes in your personal affairs. As the movie will be having a lot of fun situations, it would keep the keep the audience intact. Tini, who had earlier crooned a promo song with Dulquer Salmaan in Salam Bappu's Manglish will render his voice for a Hindi number penned by filmmaker Major Ravi. The song 'Dekho Main Tumpe Kitna Marta Hoon' will give not only a nostalgic feel, but see him mimicking Bollywood icons like Dileep Kumar, Dev Anand and Shammi Kapoor. 'Anyarkku Praveshnamilla' will be having two songs while Jassie Gift has lent his voice for the second song. Jayakrishna himself has tried his luck as music director for the Hindi number. The song would be a visual treat with the dressing style of the 60s and 70s being incorporated for the cast. Sheensha, a newcomer has shared the song along with Tini Tom. Suraj Venjarammoodu who is riding on the success of winning the best actor at the national level would don yet another interesting role 'Anyarkku Praveshnamilla', a roller coaster. Sameer Haq has wielded the camera for the movie. After the final cut, the movie would reach theatres very soon.